Caprylyl Methicone, Boron Nitride and C30-45 Alkyl Cetearyl Dimethicone Crosspolymer. Velvesil* Mul-T gel by Momentive Performance Materials acts as an anti-aging, sunscreen and anti-acne agent. It can deliver a luxurious feel, enhance natural coverage & minimizes fine lines and wrinkles. Exhibits cushioning texture for non-tacky enhanced sensory feel. Offers fast rub-in and a natural looking, instant soft focus effect. 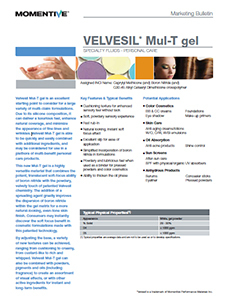 Velvesil* Mul-T gel has the ability to thicken the oil phase. 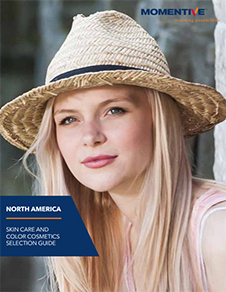 Used in BB & CC creams, foundation, make-up primers, eye shadow, creams/ lotions & w/o, o/w and w/Si emulsions. Also used in SPF with physical/ organic UV absorbers, serums, eyeliner, concealer sticks and pressed powder.